Are you looking for decent clothes in reasonable price? 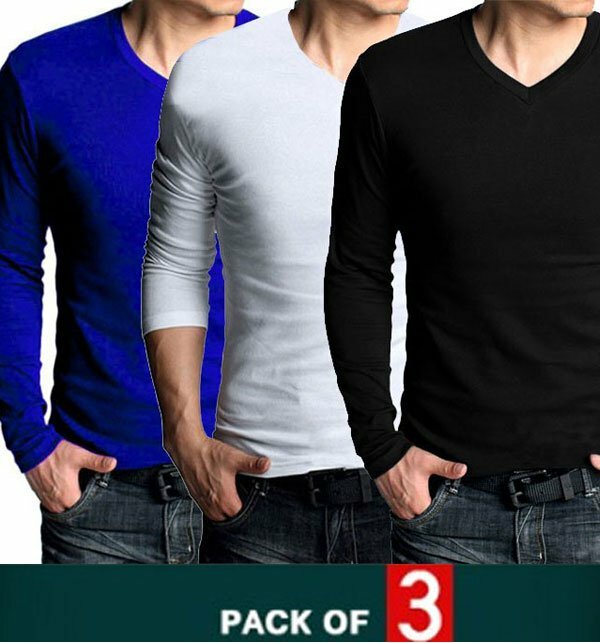 Presenting a pack of 3 that gives you three V-neck long sleeves t-shirts in amazing discounts. You are welcome to place the order for pack of 3 online anywhere from Pakistan. We will not charge you any penny for shipping or delivery. Receive your order within 2 to 5 working days. the t-shirts were very nice. Please tell me how to get a large order of these shirts for selling off to the general public as the prices are amazing for both retail and personal use. What I think is good for me is the fact that these combine simplicity and comfort which is much preferred by the public. i am really really mad at these shirts as i think that these are the best shirts i have ever seen in my life so i would just like to ask that can we choose the colors by ourself or it will be packed randomly because i want some colors only. the quantity of 3 shorts seems a little less. although i have not really required more than 3 pieces but i will require more than 3 pieces to share with my brother. that's why i am so keen on giving my opinion. i am totally amazed by the quality of these tshirts. the only thing i don't like is the strange v-neck. although that's what it is in fashion i know but what i don't find good is the lack of round neck variety. pack of two t shirts are the most convenient to buy. although the quantity may seem a little short but this is the best in my opinion as we still have room for more variety of different designs. Dear Shafi ur Rehman, Please place an order by filling up the "order form" at the right top of the screen, in order to buy this product. Send me 3 v neck shirts colored red, blackand gray small size.delivery address is shafi.ur.rehman yousof khan colony muree road near gulf shopping mall Abbottabad. Awesome!! T-shirts with reasonable price. But product quality will confirm after delivered to concern. Dear Admin I have book order for Pack of 3 V-Neck Long Sleeves please quality should be perfect . Dear Salamat Masih Athwal, pack of 3 means a package will contain 3 different V neck T-shirts. Sir pack 3 kya hy aur price ak ka hy kya v tshirt ka? You are looking now latest Pack of 3 V-Neck Long Sleeves T-Shirts (DT-01) price in pakistan market 2017 including in all major cities, Pack of 3 V-Neck Long Sleeves T-Shirts (DT-01) Price in Karachi, Pack of 3 V-Neck Long Sleeves T-Shirts (DT-01) price in Lahore, Islamabad, Faislabad, Pesahwer, Quetta, Multan, Rawalpindi and many more cities.